Local artist Doug Halliday of Doug Halliday Artwork is nearing the end of his very own Ellen-esque 12 Days of Giveaways on his Facebook page and he took some time to speak with The Racket during the very busy Christmas season. “I LOVE Christmas so thought it would be neat to give away some artwork,” said Halliday. He sees these giveaways as a way to say Merry Christmas to everyone who has supported him over the years. Halliday, who currently resides in Conception Bay South turned his artistic hobby into a business in 2013. “From a very young age I grew up being drawn to anything involving art,” he said. Halliday remembers that his aunt who he describes as “very artistic” saw potential and encouraged him to draw anything from sports figures to superheroes. He put his interest in art on the backburner for about a decade however when a teacher discouraged him from drawing comics and it wasn’t until returning to university that he picked up the sketchpad once again. Drawing became a stress relief for him but after completing a piece depicting Newfoundlanders in the NHL entitled “Home Town Boys”, Halliday began getting requests for prints. “I never in a million years thought people would like my art let alone want to buy it,” he said. With that he started his Facebook page and in 2015, the Gallery he deals with suggested doing shows like Christmas at the Glacier. Taking part in these Christmas fairs runs from October to December and Halliday is very busy but said he works on pieces throughout the year. “[It] can be very challenging with a day job and two toddlers with a ton of energy [and] I also get fixated on finishing pieces which can lead to a few sleepless nights,” he said. Despite this Halliday said his work doesn’t take away from enjoying the holidays. Halliday’s “Mummers” series is quite popular during the holidays. “I always drew comics and sports-related pieces and wanted to put something Christmassy out and to also start adding colour to my art,” he said. This lead to him drawing Mummers wearing the vintage hockey jerseys of the Original Six NHL teams. “I always loved the concept of Mummering but thought they can’t just be tied to a kitchen party, so really it was tying it to things deeply rooted in Newfoundland [culture],” said Halliday. This has lead to variations on the Mummers print like “Cheers”, “Rummers” and “Mummers Night in Canada”. These pieces are so popular that some people have tried to present them as their own work. Halliday said that people who follow his page are often quick to point these things out. “Most people apologize, and genuinely don’t realize that they cannot do it, and there have been a few times where they can’t see that they have done anything wrong,” he said. Luckily, Halliday was told about copywriting pieces early on and he suggests others who may want to sell their art do the same thing. Aside from Mummers, Halliday likes to draw anything that piques his interest. “I love wrestling and really want to finish some pieces that have been on my list for some time. Besides that, I love to draw caricatures and highlight the quirks of people. They’re near and dear to my heart because I may or may not have had a ton of sketch pads taken away for doing them in class growing up,” he said. 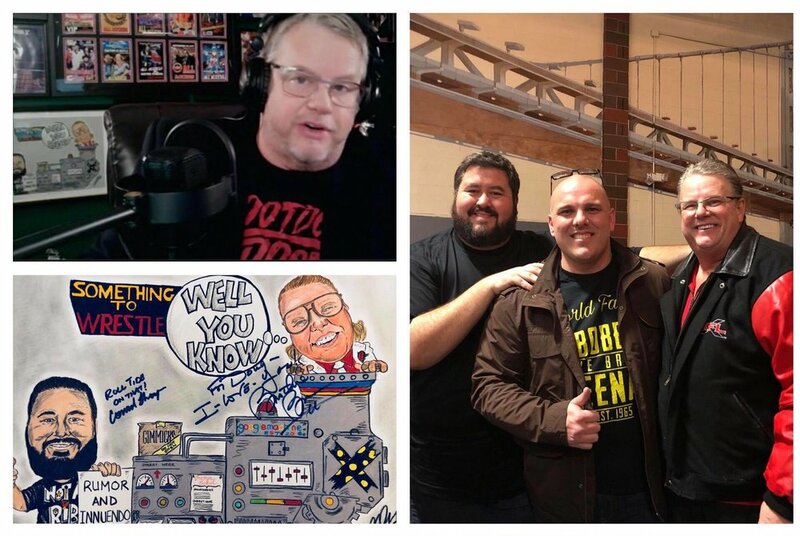 Halliday’s artwork has been seen on the popular WWE Network show Something To Wrestle With starring Bruce Prichard.